Giveaway of the day and Game giveaway of the day are pretty interesting sites wherein they give away a commercial software for free for a period of 24 hours, periodically. The software installers are encapsulated within the giveaway of the day software that connects to their servers to check the validity of the giveaway period. One of the limitations of this software is that it does not work behind authenticated proxies, i.e., proxies wherein you need to enter your userid/password to access the internet (quite common in education institutions). It seems to use the “Internet Option” settings of Internet Explorer to detect the connection settings. So, the simplest way to use the software behind such a proxy is to use a HTTP tunnel client that creates another proxy layer with the userid/password settings already entered. HTTP-Tunnel Client is a useful software in this regard and can be used to serve the purpose (something I had used earlier to make the State software work behind an authenticated proxy). 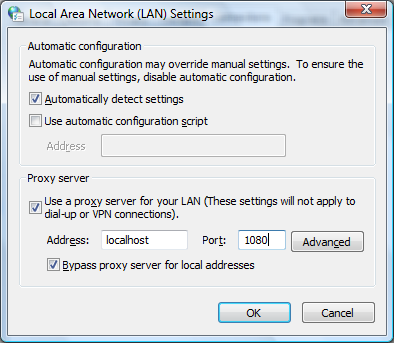 Just follow the instructions to configure the proxy in the software and change the settings in Internet Options. Once this is done, the installer should run fine and connect to the server without any errors. It may fail the first time, in which case just try once more. This is a pretty useful workaround and should work for other software that use the Internet Options connection settings, but do not support an authenticated proxy.